Pinoy Callos. Callos is another Spanish influenced dish made up of beef or ox tripe. Some version add also ox feet and knuckles or tail in addition to the tripe. For my version I used ox tripe and tail. When you are overseas it is difficult to find ox feet beside they take longer to cook. The ox tail is a good compromise since some also will not like the idea of eating ox feet. For the tripe I would suggest the bleach cleaned tripe that are available in supermarkets. The extra cost is compensated by the time and effort to clean and parboil fresh tripe bought from wet meat markets. It is also best that the tripe is already cut into strips before cooking this will also save cooking time to get them tender. In addition to the chorizo I also add bacon for that extra flavour and aroma. 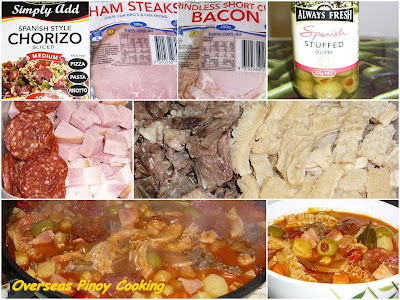 To add more meat I added cubed ham, I would not recommend using hotdog or sausage as the dish might end up like menudo. Here is my recipe of my version of Pinoy Callos. Place ox tripe and tail in a large pot and add enough water to cover. Bring to a boil and simmer for 5 to 10 minutes. Drain and discard liquid, rinse ox tripe and tail to remove scum. Using the same pot, add fresh water to cover and let boil. Simmer at low to medium heat for 2 to 3 hours. Add more water as necessary. When the ox tail meat start to fall off from the bones remove from pot, separate the meat from the bones, keep aside meat and return the bones to the simmering pot and continue to simmer for another 1 to 2 hours or until ox tripe are just tender. (simmering times will defend on the quality of ox tail and tripe). Remove ox tripe from the pot and keep aside, discard ox tail bones and reserve stock. In a large sauce pan heat oil and stir fry Spanish chorizo and bacon until it start to render fat, remove chorizo and bacon from the pan and keep aside. Using the same pan and rendered fat sauté garlic and onion until fragrant, add in tomato and red bell pepper continue to stir cook for 2 to 3 minutes or until tomatoes start to crumble. Add in tripe, ham, potato, carrot, tomato paste, paprika and bay leaves stir cook for 1 to 1 1/2 minutes. Pour 2 cups of reserved stock, add in the ox tail meat, fried chorizo and bacon bring to a boil and simmer for 6 to 8 minutes. Add in olives, chickpeas and cheese and continue to cook for another 1 to 2 minutes until the cheese are blended to form a thick sauce. Season with salt and pepper to taste, remove from heat. i have been searching for the perfect callos recipe that my husband remembers from his lola's sunday dining table. thanks to your site- am happy to say that i have finally found it! hubby has requested this to be included in the recipe book that we're compiling for our daughter - the best of our family recipes. next project? i'm going to try making your kare-kare! Hi Karen, Welcome to OPC. Is there any alternative to chorizo?in case i don't have any?